The crowning jewel of The Cromwell hotel, Drai's Beach Club provides an unrivaled view encompassing the entire Strip and beyond. Designed by lifetime industry professionals from the most revered venues in the world, every aspect has been considered, reconsidered, and perfected. 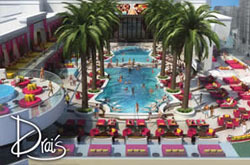 Challenging the idea of a conventional beach club, Drai's is built upon the fundamental principles of sophistication, innovation, and authenticity. The Strip's only rooftop Beach Club includes multiple pools shaded by 10 towering palm trees. Varying cover charges may apply on weekends.